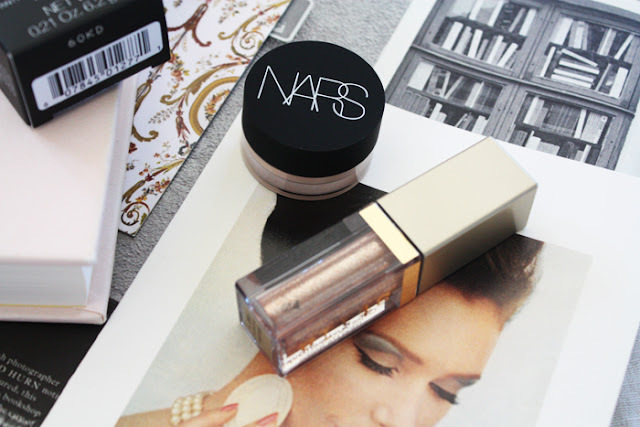 NARS Soft Matte Complete Concealer: When NARS launch a new concealer/base product I do sit up and take notice. They do many beauty products well but it's their foundations, concealers and of course the famed eye primer in particular that I love. This new concealer is designed to be heavy duty but surprisingly it is not thick so you don't look like you've caked it on. How NARS do that, I don't know, magic I suspect. There are sixteen shades, ranging from very pale to the darker colours. I have shade Light 2.5, the third lightest shade, better known as Creme Brulee. Soft Matte Complete concealer is great for pinpoint concealing, so I tap it on to my face with fingers and then use a detailer brush to blend it in. Hygiene-wise it isn't ideal, being in a pot but then again unless you're a makeup artist that probably isn't going to be a major issue. I highly rate this concealer though. Stila Magnificent Metals Glitter & Glow Liquid Eyeshadow: These liquid eyeshadows have caused quite a frenzy. To the point where they sold out in hours apparently and Mecca aren't overly sure when they will be back. I am hardly surprised by that though because these are stunning. If you like glittery eyelids, that look like they're drenched in liquid metal, this is for you. They deliver on their promise of no fallout, at least not until they're removed and stay put once they're on the lids. The shade Kitten Karma, a champagne shot with silver and copper reflects is just exquisite. Rose Gold Retro is top of my list, come the eventual restock. -Have you tried either of these products? What did you think of them?